The Word of the Lord is a consuming fire. It is also alive, powerful and sharper than the sharpest sword. The Word of the Lord will burn away iniquities from your life. The Word of the Lord will pierce your soul spirit and body. It also knows the intent of your heart. 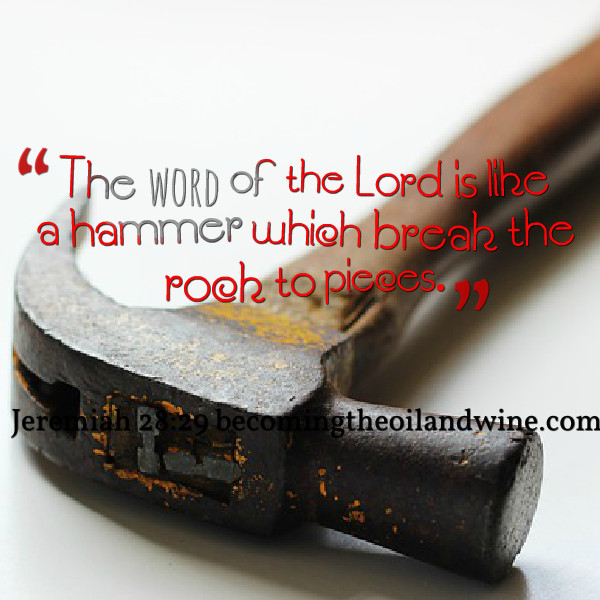 The Word of the Lord is like a hammer which is capable of breaking every hard and stubborn spirit. Your body needs food to nourish it and your spirit and soul need the Word of God to live. The Word of the Lord is precious and it must be revealed to you (1 Samuel 3). When we hear the Word of God it is imperative that we obey and not reject it. Rejection of the Word of God leads to demotion and attack from the enemy (1 Samuel 15). Therefore, let the Word of God dwell in you richly and let it manifest freely in your life. The Word of the Lord will endure forever! AMEN! Additional reading: Hebrews 4:14; Colossians 3; 2 Thessalonians 3:1; 1 Peter 1:25.